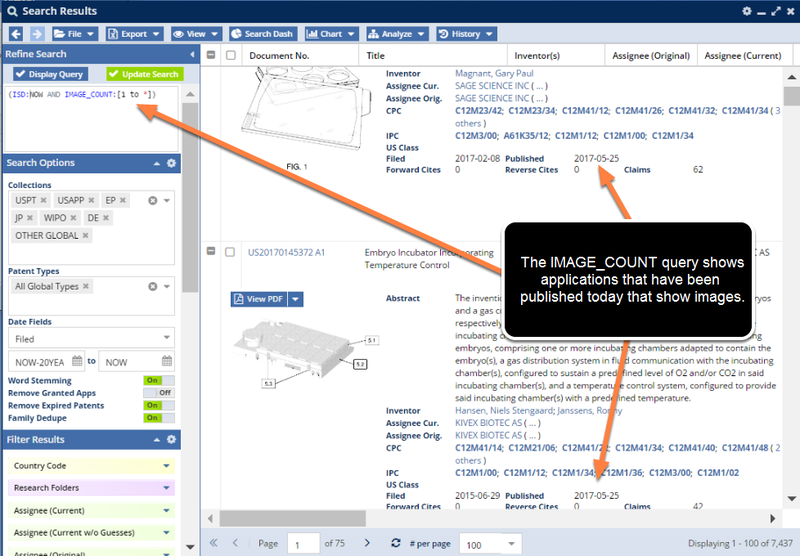 Use the IMAGE_COUNT field code to query patents by the number of pages of figures they have. Images are added the same day that patents and applications are published. The above example shows a search I ran on 05/25/2017. As you can see, the IMAGE_COUNT data field shows patents with images that were published on 05/25/2017. IMAGE_COUNT:0 --> Shows patents with no figures. IMAGE_COUNT:[1 to *] --> Shows patents with at least one page of drawings. ISD:NOW AND IMAGE_COUNT:[1 to *] --> If you execute this query on a Tuesday (for US Grants) or a Thursday (for US APPs), you can see that we have all the images for the documents each week the same day they are published.